Turnkey Furnished! This three-car garage pool home has what it takes to capture the discriminating buyer. You will appreciate the well-designed floor plan where the combination living room and dining room set a refined scene for entertaining. Double french doors lead to the office which has a closet and can be used as a 4th bedroom. Preparing your favorite meals is a delight in the well-appointed kitchen with tile backsplash, stainless steel appliances, pantry and breakfast area with sliders to lanai, perfect place for your morning coffee. The kitchen is also open to the Family Room for seamless entertaining. The Family Room features a double tray ceiling treatment with crown moldings and the sliders pocket expanding your living space to the outdoors where the heated pool area provides the perfect venue for poolside gatherings. Pamper yourself in the Master Suite where luxurious details include sliders to pool, suited walk-in closet and a Master Bath beautifully equipped for relaxation. All baths have granite counters, china sinks and framed mirrors. Other notable features include: alarm system, painted garage floor, gorgeous wood cabinetry in laundry room over washer and dryer, speakers on lanai and exquisite window treatments, light fixtures and fans. 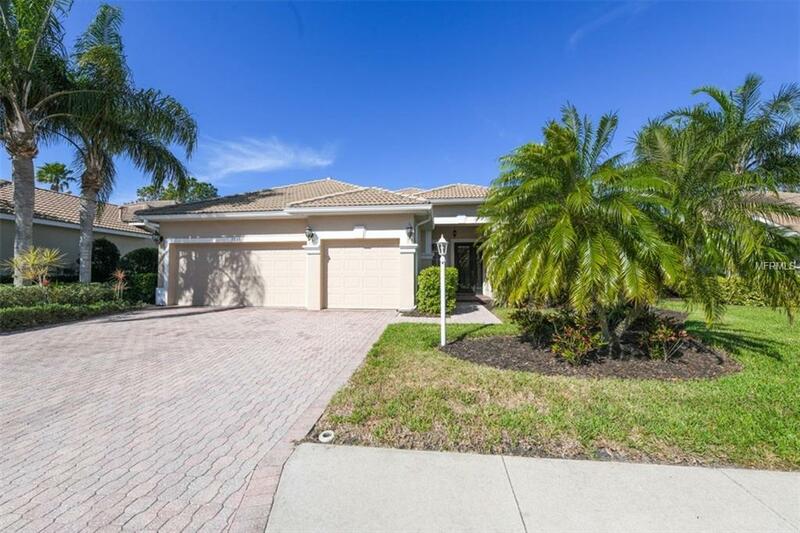 Located in one of the maintenance-free communities in Lakewood Ranch Country Club, you are within easy reach of miles of peaceful nature trails and parks and just a short distance from the Main Street lifestyle shopping district and UTC Mall.